Priordial Sea I-IV are part of an extensive series of prints made using the decontruction printing method on kimono lining silk. I was able to pull enough prints to fill an entire 108" piece of the silk. Because of the deconstructive nature of the printing, each image differs slightly from the one before and after it. The screen I used to make this print was prepared with only two colours of thickened dye: Silk Black and Bronze MX dyes. All of the actual "pulls" were made using untinted print paste. The silk was cured and cut into individual prints all of which are approximately 8" x 10". The prints are hand quilted using a copper metallic and varigated black/white/gray polyester thread. Each print also has a single, black keshi pearl sewn to it. They are then mounted and double matted with acid-free materials. These 4 of the series were then framed. 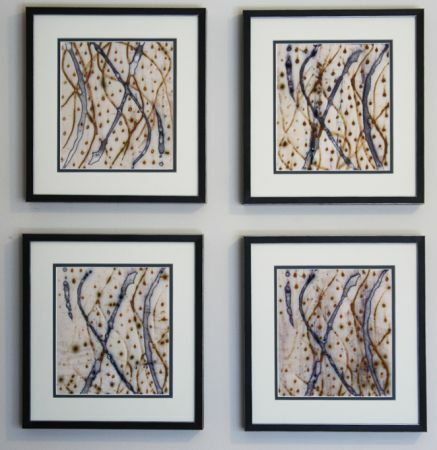 The name for the series came from the resemblance between the prints and what I have seen on slides of pond water viewed on microscopes in biology class so many years ago in high school. Currently I am working on the next four in the series. They will be available starting in July or August of 2010 as either individual pieces or in series of 2, 3 or 4; mounted and matted. Framing will left to the purchaser so that the pieces will fit in better with their colour scheme and/or decorating.